This Rumble ended on 2005-01-31 00:00:00.0. General Appearance: Short, squat, smelly, wrinkled and dirty. Quote: "Size matters not. Look at me. Judge me by my size, do you? Hmm?" Yoda felt the disturbance in the Force. It was a strange sensation. In all his long life he had never felt anything quite like this. It was neither good nor bad. It just “was”. His curiosity had gotten the best of him and the gnomish Jedi Master shuffled along the dark corridors of the cave he had discovered. He knew that some day in the future he was destined to perform some great task for the Light side of the Force. But as of yet he had been unable to fathom his part in the grand scheme. As the ancient Jedi Master wriggeled through a whole in the cavern wall toward his destination he thought about his life in Dagobah. For the most part it was a simple life, if one could ignore the swamp creatures and mutated creatures that occasionally crept from the wilderness. That made him think of a rumor he had heard years ago about mutated hairless ewoks that the Empire had supposedly created for forest warfare. Yoda shook his head and chuckled at the preposterous thought. A disturbance in the Force stopped Yoda in his tracks. A strange glowing appeared ahead like a portal of some sort and it was headed straight for him. Bupu took the strange stick out of her nose. Now that both nostrils were clear she investigated the swirling designs on it. Mumbling to herself she inadvertently recited the words that activated the wand and a brilliant ray of light shot out against the wall opening a whole to another dimension. The Gully dwarf’s first reflex was to dive behind a rock, but then she remembered her friend Raistlin and she decided that she would be brave for him. He wouldn’t cower in fear. He was a powerful magic user and Bupu was determined to be just like him. She had been practicing her special brand of magic with rats, lizards, snails and other vermin. Now she was the most powerful wizard in Xak Tsaroth, if not Abanasinia. At least that is what she believed. Wait something was coming out of the portal. It was a little green disfigured gnome. Obviously it was from a bad bad place. Bupu decided she had to stop it and began to gather her great magiks. Yoda entered the portal and saw a strange small creature before him. It MUST be the hairless ewoks! The Jedi Master pulled out his lightsaber in anticipation of a fight. “You no come my home ugly gnome. Bupu thump you good!” the gullydwarf yelled in fright. “Fight you I will. Bring it I will. 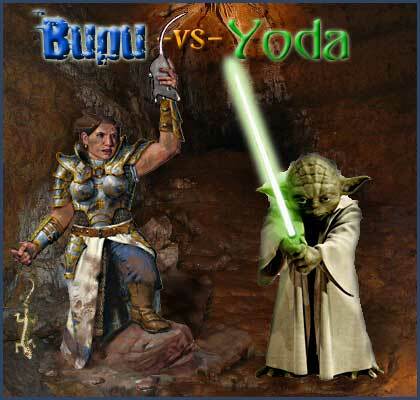 Prepare to die you should.” Yoda said in his strange dialect. Neither one really understanding the other they began to fight.